Four years ago, in the inspirational environment of the Lesser Bank, the fashion designer Josef Klír opened his dreamt-of salon. It’s definitely impossible to miss his clothes – or his remarkable hairdo. 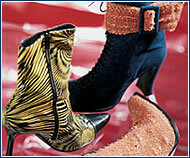 THE ARTISTIC Klír is one of the most sought-out Czech fashion designers, and his hallmark is unmistakable. Thanks to his audacious and original designs and provocative combinations of various cuts, colors, and materials, he is often called the Czech pioneer of extravagance. “I definitely don’t want to place any limits on my creative work,” says Klír. He adds that it’s hard to define what is normal and what sets something apart from the rest. “It depends on what people consider normal. 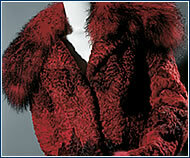 Some people might consider dyed furs as eccentric.” Klír’s collection includes combinations of silk and leather or denim, and he’s willing to work with real fur. This may be why show business figures often contact him to design costumes. I chose as I did. Practical experience gives me chances to learn something, as well as more opportunities.” At that time he moved to Prague and went to work for a fashion studio that produced costumes for film and theater, among other things. “I didn’t get to bring my own ideas to reality, but I learned a lot about technique there,” says the designer. He then became independent, establishing his own fashion salon soon thereafter. In addition to clothing, he designs remarkable accessories – his latest collection included handbags made of tattered denim under which leather is visible. Just about anything can inspire him, be it an unusually dressed person, an interesting film or architecture. Anyone can walk right into his studio off the street. “I like working for specific customers,” says this designer, who is toying of late with the idea of presenting his work in other countries. Green tones that look fresh and new conceal a power that brings positive vibrations. So buy a few accessories and wait for an influx of optimistic energy. 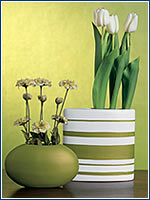 Ceramic vases from the Viva collection are inspiring by themselves. Flower arrangements are easy. Green CZK 185, striped CZK 295. 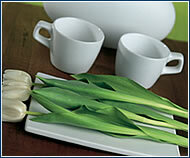 Simple, effective, and pleasing to the eye: ceramic pots and plate from the Duplo collection. ASA. Cup CZK 279, plate CZK 215. 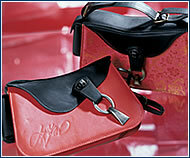 Designs based on clean basic shapes offered by nature herself. 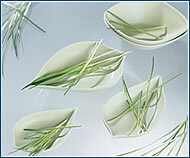 Ceramic bowls from the Smooth collection. ASA, CZK 449. 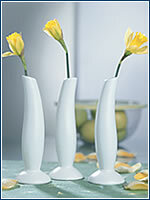 “Dancing” vases look best in groups, where their irregular shapes, reminiscent of plant stalks, stand out, CZK 285. HOW TO DRESS UP AN INTERIOR: An apartment is so much cozier with textiles. If you long for French lightness, Italian style, or English decorations, you should visit Nobis Studio’s new, spacious showroom, which offers a broad range of decorative fabrics, wallpapers, carpets, and furniture for classic and modern interiors.